That’s a great, pretty much exactly what it was! That is indeed an impressive church – the stain glass looks wonderful. 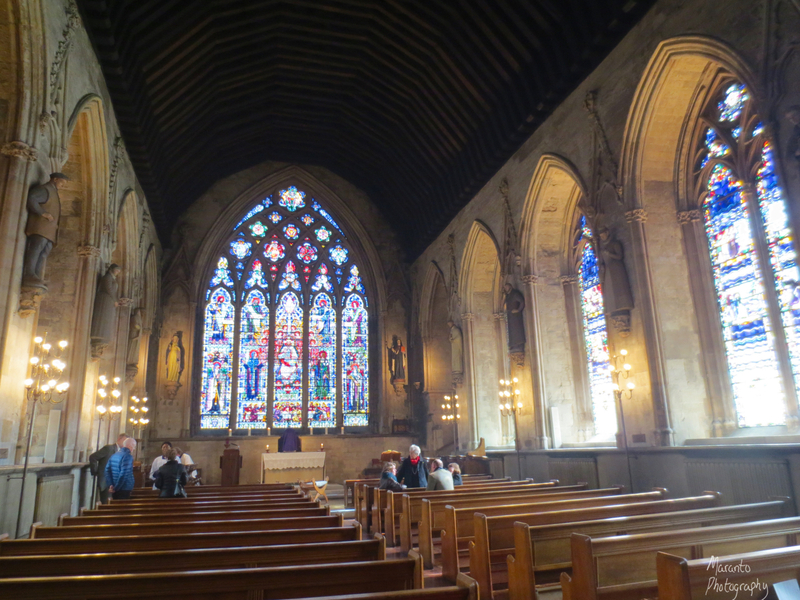 I’m interested in the history of this place and how it remained a catholic church, even through the Tudor period and all the religious upheavals that brought down on us. 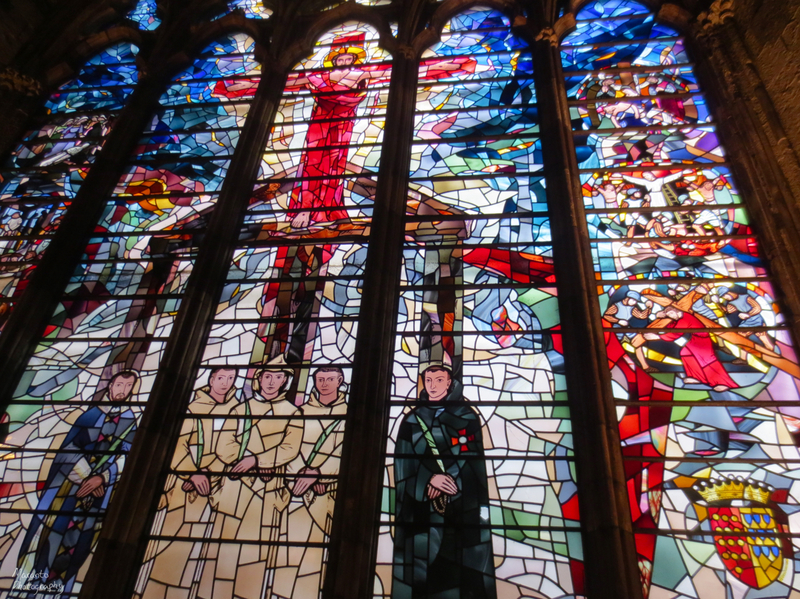 I dp like that photo of the stained glass – it’s not always easy to get a shot of. There’s nothing wrong with being a history nerd! I’m liking that postbox as well (god listen to us!) and I don’t blame you for seeking it out. Apparently there are some really early green Victorian ones about as well (I think they’re Victorian) anyway). I have seen one but it was i somebodies garden wall being used as their letter box. And nothing wrong with a point and shoot, they’re great cameras to keep on you. A lot of the photo’s on my blog were taken with my old 4.0MP Canon G3 I was given for Valentines day. So, the short answer here is that it has not been a continuous Catholic church, it was, then it wasn’t, then it was again. These things happen! I got lucky with that stained glass, which I agree, is often difficult to shoot. In this case, a huge help was its location much closer to eye-level than you would normally find a window like this. Needless to say, I completely geeked out while we were in Dublin, and tracked down a green Victorian postbox there. Here I went the easy route, Victoria is in front of Queen’s College in Cambridge. A good place to go in search of a queen I suppose! my little postbox obsession has leaked into my Instagram. I also think there is nothing wrong with a point and shoot or for that matter my iPhone. I mention it when I use those cameras on this blog in part because I think one thing photographers geek out about is gear. While that can be fun, I think there is the danger of falling into the mode of thinking that in order to get a photo you have to have all the gear, and that just isn’t true. I fully agree – it’s not the camera it’s the bod behind it. Aaah! London. I just love going there. Loved the postbox and I too have visited St Etheldreda’s Church. Thank you for the little walk. That church really is a gem. Excellent. I still have an ELPH 100 but I’m using my SX200 since I stupidly lost my ZS100. The drawback of a pocket camera. I lived in London for 6 months while working in England for 4+ years, centered around Swindon. Lived in Bath for 2+ years. As you may know, in the U.S. some people use white ‘subway tile’ for interior decorating, mostly in bathrooms. My personal preference is that it remain in the subways, as you have aptly pictured. Brings back memories. 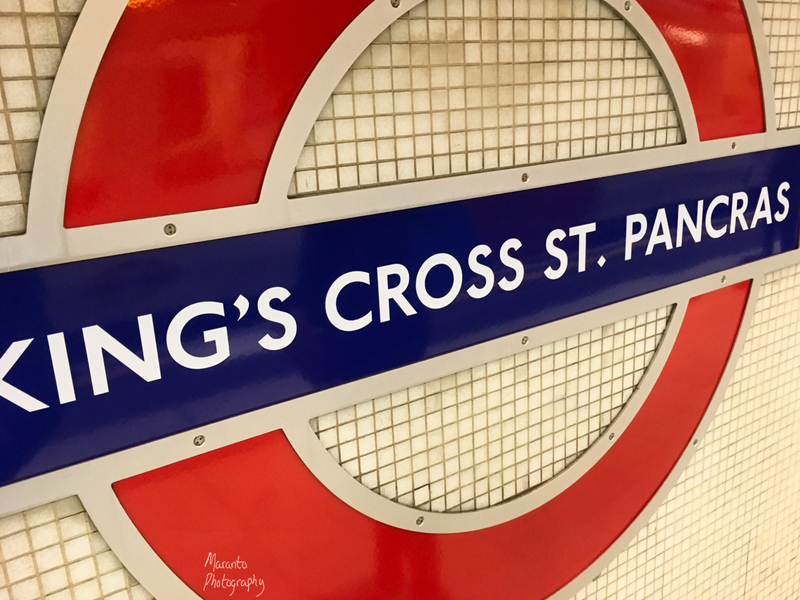 Yes, those tile signs really are a bit of an “icon” of London, and as I am sure you remember can be found on just about everything a souvenir shop is willing to sell you. We were in Bath for a few days last year, what a lovely town that is. So that was your day which featured 2 Edwards! Like you, my family waits patiently while I am excitedly taking photos! The church is beautiful too. Yes, separated by just a few years in history lol. Looks like a great time out for you in London, and hope it was a great catchup with friends. I like to make lists too, be it every day lists to shopping lists to travel lists. I really find it helps me to stay organised and not forget anything. Yes, I have a list for just about everything. But it helps me stay on track and I also sleep better! A visit to London looked fun! The glass in the church is beautiful! And enjoying history as you walked and took pictures made it fun ! Yes, this was a really nice day out for me 🙂 Thanks for taking a look. Mmm, history! I just love the English postboxes! Lovely post all together. Amy, I loved reading about your day, your walking tour, it was helpful to hear you took the 2 church photos with a point-and-shoot, I was making mental notes for when I might like to try that type of camera vs. the smartphone or the full SLR. Loved the bit of history background on the postbox, my daughter would be super-excited. She is such an Anglophile history buff. 🙂 Thanks for a fun reading post, Amy! Yes, the weather and potential crowds made me hesitant to take my larger camera. I also was confident that I could get the photos I wanted with my two smaller cameras. 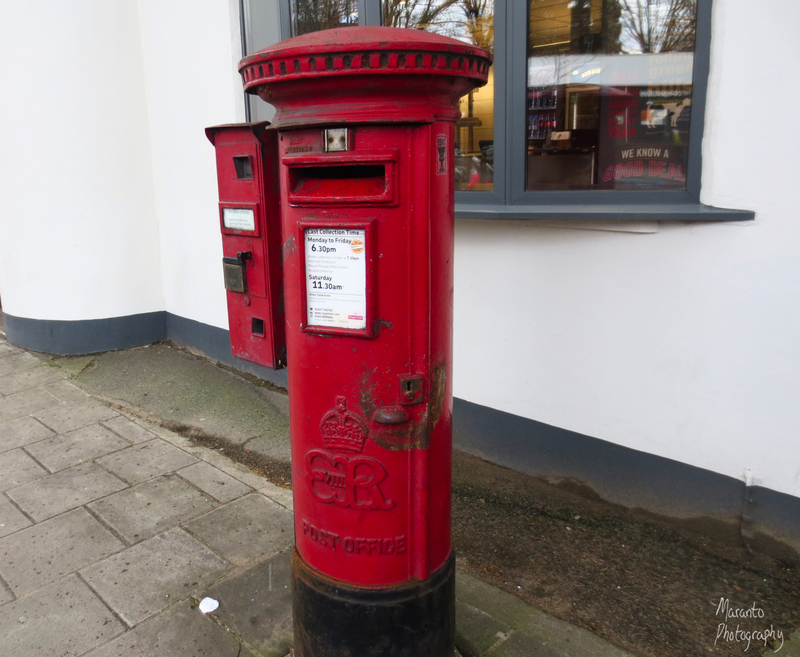 This postbox was the last monarch for my collection. The others are much more numerous, so much so that I have just happened to find each of them without any research. That being said there are a bunch of other variations, so there are far more for me to find. I think you’ve inspired me to dust off my point-and-shoot and give it a try. Just pulled out the battery charger, going to plug it in. hah! will keep you posted! Sounds good. Of all my cameras, I find I use that one the least, but when I do, it’s a really nice thing to have. This particular one is giving me a bit of trouble as it really has been loved to death, but I continue to use it until its bitter end. Hey! I did a great little project for a creative “assignment,” using the point&shoot camera yesterday. 🙂 Great inspiration! That’s very cool, will it be a blog post do you think? Even if it’s not, thanks for letting me know as I always find these connections of creativity very interesting. Hi Amy! Just posted for this evening, and the photos I took were all done with a Canon PowerShot SD1000 point-and-shoot. Thanks for the inspiration! These photos are fabulous, Amy! Thank you! Well that’s the best way to do it. It seems that you had fun too! Thanks for sharing.